Winter Solstice photo. The sun dips into the well….. The Real Jesus Was A Rich Warrior King! Ralph Ellis…..
Francis Bacon and the Merchant of Venice: A Talk by Simon Miles…..
NOW PLAYING! December 18, 2016 — Dr. Jeffrey Meldrum – BIGFOOT….. Reality Check: 3 Facts the National Media Isn’t Telling You About The Battle For #Aleppo….. 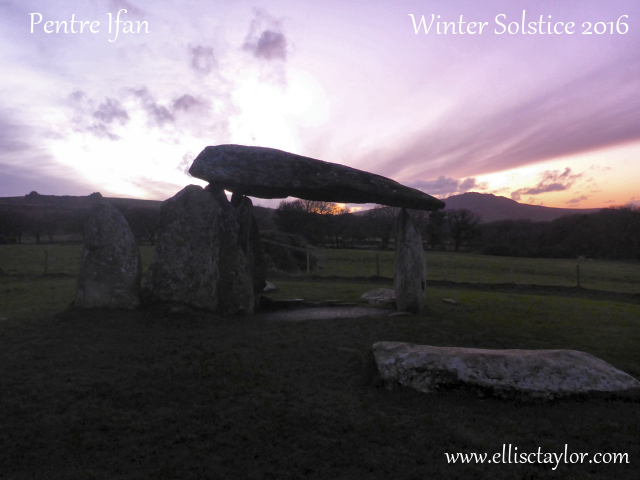 The sun didn’t make it through the clouds for the Solstice sunrise but Solstice sunset at Pentre Ifan was pretty nice. Notice how the sun dips down into the cleft of the Gwaun Valley. Sounds a little bit similar to Jesus and the 12 Disciples Doesn’t it? Sounds a lot like the Zodiac, with it’s 12 star signs and a sun (son) in the middle. It is believed, that King Arthur & his knights was a fictionalized English version of the true Jesus origin story that borrowed elements from other historical figures. This was the Knights Templar’s way of telling the truth without getting executed or tortured to death by the church. His mother was a rather brazen woman who put her face on the coinage which angered many. She was driven out and took hundreds of courtiers and half the treasury with her. Her son became King Esus of Edessa. However, this conflict got him crucified as Emperor Vespasian eventually won the conflict. With the revolution over, word of rebellion spreading throughout the empire had to be stopped as soon as possible, so the King, was crucified. After 3 days on the cross, Rome’s official Jewish historian Josephus Flavius, ordered him to be taken down and given medical attention which saved his life. Flavius then proceeded to rewrite the history for Rome’s sake. Was a bit too inspirational a story for Jews who’d just been kicked out of Israel and scattered across Europa & the barbarian hordes Rome had waiting at the gates. So instead, Flavius changed the history, rewrote many gospels and made Esus into Jesus, a pauper pacifist friendly to Rome who would sooner “render to Caesar the things that are Caesar’s” and “Turn the other cheek” in order to pacify the masses rather than lead a revolt. Many disparate Christian factions fell in line behind Rome and the myth is still widely believed to this day. In this talk, Simon Miles explores the historical background and literary sources of The Merchant of Venice, and presents surprising new evidence pointing to Francis Bacon’s authorship of the play. It follows on from an earlier talk he gave to the Society in 2009, in which he discussed the events surrounding the Affair of the Dutch Churchyard Libel in 1593, and their connection to the first emergence of the names Marlowe and Shakespeare in relation to writing and the theatre. This entry was posted in A voice for nature, alignments, Ancient, Ellis Taylor, Footsteps, Howlin' at the moon, Mystical, Nature, Portals, Sacred sites, Uncategorized. Bookmark the permalink. Thank you for this, Ellis. I was completely confused as to who was fighting who in Syria. Surprising for something like CBS. Now the murder of the Russian ambassador makes sense. I despise Putin, but he’s helping Assad against the terrorists. You’re the best, Ellis! Thank you Ingrid. I’m not surprised you were confused; nearly everyone is I’m sure.It’s what happens when the media is as compromised as it is today spreading one-sided and false information while people’s instincts and intuition are telling them something different. This is a brilliant presentation of the facts… and from the mainstream!! It needs to be more widely spread. I was listening to this same Vinny Eastwood show in the early hours of yesterday morning but didn’t finish, thanks for reminder and extras. Oh, wishing you and yours a warm and pleasant Solstice. You are very welcome Serena and thank you. Wishing you and yours the compliments of the season and best wishes for the year ahead.